"When you are not writing, be thoroughly not writing; when you are writing, be writing through and through." 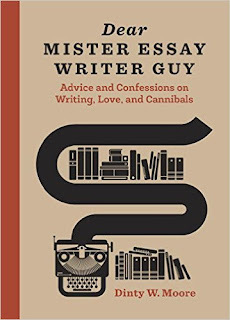 Wry and sarcastic, Dear Mister Essay Writer Guy is a delightful book to have on your shelf--even if you're not a writer. Filled with questions about em-dashes, Facebook, Zebras, cocktail napkins, and polar bears, to name a few, Moore responds with essays in a myriad of forms, which will delight readers. I really enjoyed the blend of humor and helpful that Moore employed throughout his answers. Even his illustrations sprinkled throughout the book tie into the questions he's asked to answer; polar bears included. As a writer myself, even though I write fiction primarily, I found myself giggling as I read through the different responses to the questions provided by some of today's top contemporary essayists. Definitely a fun gift idea for the writer in your circle.